We are a month into the season, and the closer carousel is a full go. This is the first edition of the Bullpen Report, where we take a look at possible troublesome situations, as well as injuries. Be sure to check out the video podcast as well. You know, if you don't feel like reading. It has been somewhat quiet on the closer front. Shawn Tolleson leads the American League in saves with ten, and Kenley Jansen with ten in the National League. That is not the reason you are here. You want to find situations that could lead into saves for your fantasy teams, and that is what I am here for. 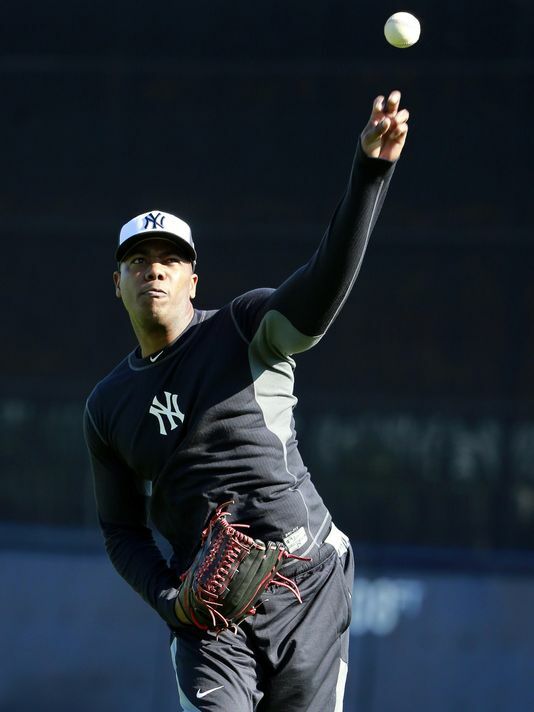 On the injury front, Aroldis Chapman is nearing return. Not an injury for him, but he is due back from a lengthy suspension. Joe Girardi made it very clear that Chapman would be thrown right into the fire. The Yankees' bullpen is capable of surviving without Chapman. Andrew Miller and Dellin Betances both get a downgrade, unless you are in a saves+holds league. In that case, go ahead and hang out to both. While the Yankees are struggling, Chapman will instantly come in and start delivering saves. He has a career 43% strikeout rate, and has recorded 30+ saves in the last four years. Zach Britton is the next closer on the injured list, and is another AL East product. He is back in action for Baltimore, and threw 1.1 innings on Thursday against the Yankees. He struck out three hitters over four batters faced, and walked one. He was dealing with a sprained ankle, and looks completely 100%. If anything was to happen to Britton, Darren O'Day would be the immediate add. AL East keeps us busy here. Brad Boxberger has started his rehab assignment for the Tampa Bay Rays. This was not a fantasy friendly situation last year. Injuries, and a committee was the story last year. Alex Colome has been holding down the fort, who could still hold the closer role when Boxberger comes back. He has seven saves this season, and a 32.6% strikeout rate. His 2.53 FIP is also promising. It will be interesting to see what happens when Boxberger comes back. This is something worth monitoring. Boxberger had 41 saves last season, but did have some rocky outings. Now we will dive into some teams with messy situations, and or fillers. Huston Street is on the 15-day disabled list, dealing with an oblique injury. Joe Smith has filled in, and recorded two saves since he has gone down. He is likely floating around your leagues at the moment, so if you are sort of streaming leagues, give him a look. He is in a spot to get saves, yet is not a strikeout reliever, nor a quality arm. The Reds bullpen is the biggest question mark so far. J.J. Hoover has been completely unusable in fantasy right now, and was optioned to Triple-A as of today. He has a 14.34 ERA over 10.2 innings this season. Bryan Price has been saying things like “We'll put him on a 10-day schedule to get as much pitching in as he can in that time. If he's ready to go, he'd certainly be a consideration to come back here." This might be a temporary thing. Tony Cingrani and Caleb Cotham are both guys who could see some time, but overall neither possess major qualities to lock down a ninth inning role. Cingrani has a 16.4% walk rate, which is a huge issue. Cotham has a 3.92 FIP, and just a 17.1% strikeout rate. His walk rate is also 10.5%. Once again, not ideal here. You are playing with fire, but if you are desperate, these are the two honorable mentions. The Phillies situation has been interesting. I have had a share or two of Jeanmar Gomez, who has recored nine saves this season. I am grateful for those nine saves, but he might be coming to an end. He isn't a big swing and miss guy, with a 17.4% strikeout rate. He also has allowed a .351 wOBA to right-handed bats. Philadelphia's closer situation was iffy coming into the season, and it continues to be that way. Gomez should continue to get save opportunities, but also keep an eye on these names if he faulters. Hector Neris has a 38.6% strikeout rate this season, and has a 1.96 ERA.